A number of non OECD countries have been added by the OECD - China, India, Brazil - and this makes the picture even clearer. 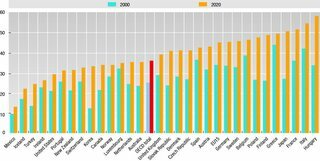 Almost all the elderly societies - Japan, Germany, Italy, Switzerland - have been experiencing low growth, and over a comparatively long period of time. 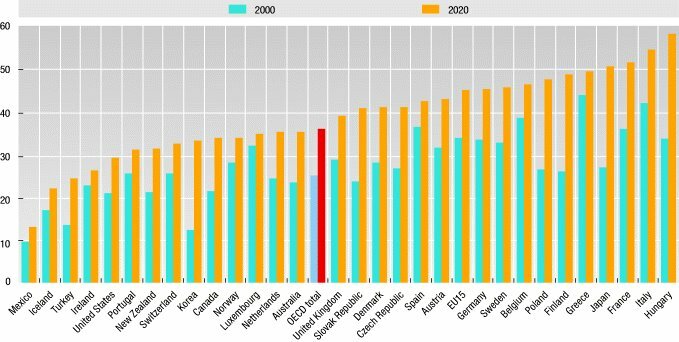 At the other end, those countries getting a boost from their demographic dividend have been having comparatively high growth (Ireland included). Including the first half of the ninetees may even blurr the contrast a little, since the situation has been most pronounced over the last decade. (Full stats on annual growth rates over this time can be found in this pdf). The situation is further complicated by the evolution of the East and Central European EU accession states, which although ageing comparatively rapidly, have been having a 'catching-up' growth boost due to their coupling with the rest of the EU. Their growth evolution will be an important area of interest in the next few years. The evolving dependency ratio situation is also of interest. One point which immediately stands out is how France, despite having a comparatively high (1.9 TFR) fertility rate, and the outlook of a steadily rising population, will experience fairly rapid ageing due to the life expectancy outlook and to the special shape of the existing age pyramid (check the pyramid link in the sidebar if you are interested). This is what adds special interest to the current debates about labour market reform. The quite rapid increase in the dependency ratio means that France has to address its particpation levels and its government debt evolution sooner rather than later if it wants to remain on a sustainable path. This article has a useful summary of the points in the factbook which are of relevance to the present debate in France. Hans, that's fairly simple: growth rates say nothing about where you are, merely where you're going. China has very high growth rates, from a very low base. Now, the US has high growth rates from a high base; consequently, people from everywhere want to come and work here. 400,000 European scientists and technologists, for instance. "the US has high growth rates from a high base"
While I agree with your sentiments, some qualifications may be in order. I think we need to differentiate intensive from extensive growth here. By this I mean what you can do with the same population, and what you can do with an increasing one. Germany and Japan may only be able to have averaged 1% growth p.a. over the last decade or so, but they have had a virtually stationary population, so that is real per capita growth. The US seems to have averaged something over three per cent (which is of course impressive) but population has been growing at about 1% a year, so this is extensive as well as intensive growth, and the difference isn't as big as it seems. Again the US education system raises sustainability issues of the model. I'm not sure whether the number of scientists and technologists you quote is gross or net, but it is clear that while you are so dependent foreign trianed talent for your needs something somewhere isn't working internally. This seems to be reflected in your current debate about immigration, since if you had sufficient upward mobility having migrants come in to do the work the native born don't want to do (or shouldn't want to do) wouldn't be a problem. Still, it is much better to have problems of too much growth for your own internal capacity (savings, skilled labour) than to have too little. "growth rates say nothing about where you are, merely where you're going." Exactly, which is why 20 years from now both China and India will be forces to be reckoned with. "Exactly, which is why 20 years from now both China and India will be forces to be reckoned with." -- not necessarily, and more probably India than China. China is headed full-tilt for a demographic brick wall and will go _splat_ fairly soon. The huge increase in working-age population as China moves through the demographic 'sweet spot' is about to come to an end. The Chinese TFR has been below replacement since the 1980's and is now headed for the "lowest low" category, down around the South Korean or Singaporean level. The population is aging quickly, the number of working-age people is about to go into decline, first relative and then absolute, and the dependency ratio is about to go through the roof. In 20 years China will have an annual surplus of deaths over births and an average age that is not only higher than that in the US, but increasing much more rapidly. Given that China's per-capita GDP will still be much less than that of the US, or any part of the developed world, and the absense of any pension provision for the majority, this is a formula for bad economic problems and social instability. Oh, and among the (shrinking) younger age-cohorts of the Chinese population, men will outnumber women by about 125:100. Note in the growth tables that all the significant countries to the right of the US are in "catch-up" mode. That is, they're either post-Communist or are developing countries. Economic growth can come either from sectoral shifts in the factors of production, or from increasing the Total Factor Productivity (TFP) with which each unit of input is used. Countries like China are shifting factors of production -- taking peasants from the fields and putting them in factories. Given reasonable macroeconomic management, this is the "easy" route to economic growth. Even the USSR achieved impressive growth-rates for decades with this method. This is true even if resources are used with gross inefficiency. Eg., it takes about $9 of investment in China to produce as much increased output as $1 in the US. But this is a self-limiting process. Eventually, you run out of resources to shift between sectors (strong young peasants, for instance) and you get to the point where wasteful capital investment can't be sustained. In a fully developed country like the US or the EU nations, growth has to come mostly from TFP increases. This is the "hard" way to grow. The US does this much better than anyone else, for a number of reasons. The major one is that there are fewer internal restrictions on labor and capital movements. The US markets are more competitive, and hence pressure to increase productivity is higher. Another thing which has to be kept in mind is the magic of compound interest. The difference between 1% growth and 3.5% may not be significant in any one year, but it adds up. From 1945 through about 1980-85, the other developed countries were growing faster than the US, on average -- hence they were catching up in terms of per-capita GDP. This process stopped a generation ago and went into reverse; which is to say, after the countries concerned had fully recovered from WWII and then gone on to complete their sectoral shifts, emptying out the last pockets of peasants and becoming fully modernized. Hence the most prosperous parts of Europe (leaving aside tiny enclaves like Luxembourg) are now in about the same place as the poorest parts of the US; Sweden or Norway, France or Germany rank with Mississipi or New Mexico or Louisiana or Arkansas. "not necessarily, and more probably India than China." Well I picked 20 years very intentionally and in a minute I will explain why. "China is headed full-tilt for a demographic brick wall and will go _splat_ fairly soon". Not so simple. I think the time scale here is very important. My guess, and it is a guess, is that China will peak in about 20 years (give or take 5 either way). India, which is more or less ten years behind China demographically, will probably peak around 10 years later. "Oh, and among the (shrinking) younger age-cohorts of the Chinese population, men will outnumber women by about 125:100". Yes, and note that India has exactly the same problem. But back to the main topic. What would going splat mean here. I think we need to look at Japan and Germany for some sort of indication. My guess is that China and India are going to develop very rapidly (the performance over the last five years is already unprecedented historically, and there is no special reason to imagine that this will slow significantly in the near term, indeed, in the case of India it might actually accelerate as it approaches the good years). Now there will obviously be no significant immigration palliative available for China and India due to their sheer scale. So what we can have come 2025 are the worlds two largest economies, with enormous productive capacity and by this stage highly adavnced technical potential (think Japan) dependent on an export driven model. The consequences of all this for the global are simply mind blowing, and this is why I am inclined towards an indermediate global deflation scenario. So splat doesn't reallly mean splat here, more like global oouzzzing. Well this depends on how much you mean by much. In real terms I imagine come 2025 GDP per capita in China will be much (and by some order of magnitude much) bigger than people are currently contemplating. We don't really know what the relative realignements will look like if we hit global deflation, and what the currency adjustments are going to look like, and of course there is the energy and other resource scarcity issue to think about. Far too many unknowns to be reaching hard and fast conclusions here yet. "Note in the growth tables that all the significant countries to the right of the US are in "catch-up" mode." Oh yes, very much so. The US is, as we've been discussing, some sort of hybrid, betwenn a developed and a developing society. Fascinating really. and you can see that the US - with a median age of 36.27 (CIA factbook :) ) is still a comparatively young society. The contrast between the boomer generation and the young Latinos which this average masks is of course enormous. Also the point you raise about the correlations between median ages and growth is very simple and very important. Strange that so many people find this so hard to see. I also think that one part of your savings issue (or rather the lack of them) is correlated with the behavioural characteristics of such a young population. There is no housing boom in Germany and Japan (eg). "Economic growth can come either from sectoral shifts in the factors of production, or from increasing the Total Factor Productivity (TFP) with which each unit of input is used." Again I think you are partly right, but you are oversimplifying. Economic growth - per se - can come from a variety of sources, it can simply come from having a growing population and thus more people working. Current US growth has a component which is based on this, since the US currently has a natural population growth rate of 0.92% per annum, which is comparatively high. China, for eg, is only growing at 0.58% per annum. Sothe really interesting thing at the end of the day isn't growth per se, but per capita growth. This can come from a number of sources. One of these can be simply raising participation rates, and a lot of the 90s growth in GDP per capita in the developed world (US included) came from this. Another source of economic growth is changed labour productivity, and this is normally thought to be a function of the age profile of the population, crudely put how many of your workers are in the most productive part of their life cycle. Thirdly as you say there are the sectoral shifts, moving out of agriculture into industry, moving from low value to high value industry, moving from high value industry to high end services and knowledge products. 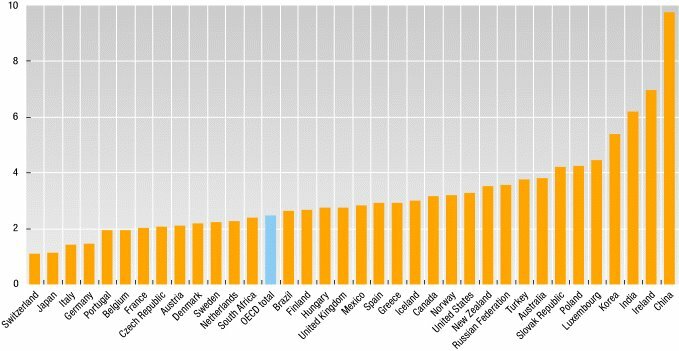 "The US does this much better than anyone else, for a number of reasons. The major one is that there are fewer internal restrictions on labor and capital movements. The US markets are more competitive, and hence pressure to increase productivity is higher." 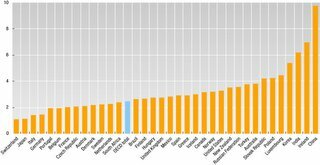 Ireland is undoubtedly the champ, and in fact France certainly seems to do better than the US at this over the longer haul, as do say Finland, and even Italy, which is a really hopeless economic case doesn't seem to do badly. Part of the reason for this, I think, is that the TFP is a residual, and as such its significance is really hard to interpret. I know how a hell of a lot of people would like to interpret it, but I'm not sure how much validity these interpretations actually have. Bottom line, this is far too complex an issue to address here. "But this is a self-limiting process. Eventually, you run out of resources to shift between sectors (strong young peasants, for instance) and you get to the point where wasteful capital investment can't be sustained." I don't think this is true. I don't think you ever run out of new sectors to move into, you simply keep inventing more: this is what growth and creativity are all about. And this is why those economies which are significantly behind the technology frontier can always get extra growth by moving up to it. There is always some kind of second mover advantage or other. Cutting age societies technologically like the US, the Uk, France Germany and Japan blaze the trail, and open the way for others, but the bottom line is that others can then always follow. Even people like Microsoft, who would seem to have a natural monopoly, find this out in the end, as the drop in the price of laptops makes their operating system just too expensive and the architecture gets redesigned around them. So China is just begining on this road. People have been leaving agriculture to go and work in low value industry. But now the labour market is tightening, and the renminbi, which is tied to the dollar is rising. So the next rung on the ladder (which will be a long ladder) is now opening up. The are going to get into middle value manufacturing like cars and car components. Also, of course, sectors like agriculture then become increasingly productive. Incidentally, one other issue which occurs to me is the distinction you are making in the US between the coastal and the interior populations. Will your interior populations be as productive as your coastal ones in the mid-term. "Hence the most prosperous parts of Europe (leaving aside tiny enclaves like Luxembourg) are now in about the same place as the poorest parts of the US; Sweden or Norway, France or Germany rank with Mississipi or New Mexico or Louisiana or Arkansas." Uff, this is way off beam. I don't know if you've visited any of these places you mention recently, but the comparison simply isn't valid. European living standards are generally much higher than you seem to be imagining, and if the figures are showing Paris as being like Memphis, then there's simply something wrong with the numbers. A quick glance at the world around us should show that. Incidentally, my dad lived for 11 years in Arkansas :). Even another 20 years of high growth will not put China anywhere near where Germany or Japan today. China will get old long before it gets rich. It's already aging rapidly and the dependency ratio is starting to go up again. And since the fall in China's TFR was so ver swift, the very same huge age-cohorts that fueled growth during the surge will act as an anchor around the neck when they hit retirement age. "European living standards are generally much higher than you seem to be imagining, and if the figures are showing Paris as being like Memphis, then there's simply something wrong with the numbers." -- nope, not if you're talking per-capita incomes. People in the more affluent parts of Europe are equivalent to the poorer parts of the US. That doesn't say anything about the Gini coefficients, of course. "I don't think you ever run out of new sectors to move into, you simply keep inventing more"
-- in theory, yes; in practice, often no. What I said was that the _easy_ shifts get done first, eg., even a grossly inefficient factory will often outproduce a peasant farm. As I mentioned, the USSR managed 50 years of fast growth by sectoral shifts. But when it had become a fully urbanized, industrialized country, it turned out to be a very _inefficient_ urbanized, industrialized country. China has some of the same problems, although not to quite the same degree. But they're going to come home to roost once the easy stuff is done. That's when things get hard; like getting the banking system rationalized, or ending cronyism, or making cultural changes. Japan ran over a related precipice decade ago. One of the warning signs is consistently low rates of return on capital. Japan had that, too. Enormous growth, very high savings rates, but low rates of return. It's a signal that capital is being misallocated. Another is low return on investment in R&D. Japan has this problem in spades -- Japanese researchers are much more productive in the US than they are at home. "That doesn't say anything about the Gini coefficients, of course." Or PPPs, or big Mac indexes :). Fraid I still don't buy it, relative values of the currencies matter here and Europe in general isn't living anywhere near as badly as you seem to be thinking, but then again, perhaps neither is Memphis :). All I can tell you is that I watch a hell of a lot of movies from the US, and what I see doesn't look one hell of a lot different from what I see here, including the variability. I also don't see big levels of productivity difference when I see people working, btw. This is anecdotal I know, but it is one informal measure. From what you are saying we are all living pretty well I guess. The old east Germany, or somewhere like that is another story altogether, of course. But even here in Spain, people in the South live pretty well nowadays. I don't think there would be a huge technology difference between what people do in the south of Spain (which is one of the poorer parts of Europe, and what they do in Mississipi or New Mexico or Louisiana or Arkansas. And like I say if the figures say something else then something somewhere ain't being measured right. Of course here in Catalonia we're in one of the richer parts of Europe :). "As I mentioned, the USSR managed 50 years of fast growth by sectoral shifts." Well I thiunk this doesn't help us, since the whole model there was bad. We don't even know how much growth there really was. I am talking about relatively open, free market economies, just like China will probably be 20 years from now. "Japan ran over a related precipice decade ago." Nope. Japan's problem was, and is demographic, that is what this whole blog is about in a way. At least this is my big bet :). Certainly Japan has now rationalised enormously, and flexibilised its labour market. It's export industries are leading edge and immensely competitive. Just like, again, China will be twenty years from now when we have had all the reforms, and more reforms, and more reforms. Remember Kurzweil, things get quicker quicker. This I think is the part of the issue you are not getting hold of. When China does hit the elderly society problems which I agree it is going to hit, then it will be a huge machine for exporting bleeding edge technologies and services at extraordinarily low prices. This, I think, is when all Brad Setsers worries come home to roost, and all those dollars start coming home to daddy. What I mean is that at some stage there will be a big revaluation upwards of the renminbi, and an equivalent downward 'correction' fo the dollar. If it is any consolation to you, by this point the Euro may be long gone as a currency. "All I can tell you is that I watch a hell of a lot of movies from the US, and what I see doesn't look one hell of a lot different from what I see here, including the variability." -- well, that's scarcely a scientific measurement, is it now? And there's a reason why "anecdotal evidence" is a polite synonym for "utterly worthless." "Well I thiunk this doesn't help us, since the whole model there was bad." -- We know that now. Most people didn't think so at the time. Ditto China. People look at all the skyscrapers in Shanghai -- as they did at the steel mills of Magnitogorsk in 1950 -- and go all oooh and ahhhh. The thing to do is look at how efficiently resources are allocated, which is best measured by rates of return. And Chinese rates of return are, overall, utterly lousy. There are profitable sectors, but there's a huge mass that's extremely dodgy. And then there's the banking system (which was also weak in Japan), the irrational politically dominated system of allocating capital, and the increasingly grotesque corruption. That's why I'd bet on India to do better in the long run. Democracy is more efficient. "Nope. Japan's problem was, and is demographic, that is what this whole blog is about in a way. At least this is my big bet :)." -- there's certainly a demographic problem there, particularly in the long run, but that wasn't why the bubble burst. The Japanese ran into the limits of their model, but weren't able to reform it because of the way it's locked in with so many vested interests. The Japanese economy has some extremely efficient sectors, but also a huge mass of inefficient small domestic businesses eating up labor and capital, it has a bad banking sector dominated by the equivalent of croynism and hence awash in bad loans, a high savings rate combined with bad capital-allocation mechanisms, etc. In fact, there are some parallels with China -- except that China is much worse, of course, because its political system is so much more backward. "What I mean is that at some stage there will be a big revaluation upwards of the renminbi, and an equivalent downward 'correction' fo the dollar." -- extremely doubtful. Apart from political risk -- unlikely to go away itself -- the reason Chinese and other Asian capital flows into the US is simply higher rates of return. As I mentioned, Chinese industry swallows enormous amounts of capital to get surprisingly modest results in terms of units invested. Also, China is dangerously overconcentrated on manufacturing, which is increasingly commoditized and is turning into a low-return sector. It can't _afford_ to revalue its currency much. The resulting crunch on the export sector would produce instant mass unemployment -- in a society with no safety net. They're in the position of a man running downhill; they have to keep going fast, or they fall over. The Indians are doing much better at IT, and are overall in a sounder position financially. "We know that now. Most people didn't think so at the time." Well it is hard to speak for most people, but I certainly think anyone who was thinking about the situation and knew some economic theory was aware that not only didn't the centrally planned economy not work, but also the reality behind the numbers was very different (the military sector being one possible exception). I started thinking about the USSR in the late 1960s, and I was aware of all this. So I think the USSR is a *red herring* Sterling. Now on China, of course what we see now is a hugely inefficient deployment of resources, look among other things at the way they are driving themselves to extract coal. But the point is, it is a much more efficient way than they had before, and every year their ways of deploying resources are getting better. They are in a huge suction machine, and they are reforming, and there will be more reform, and more reform, and more reform, and eventually they will have a hugely efficient economy (at least in some sectors, like the Japanese). This will mean, given the scale of Chinese output that they will be a very important driver in the global economy (much bigger than eg the US). The only real argument is about how long it takes them to get there. "That's why I'd bet on India to do better in the long run. Democracy is more efficient." Well I wouldn't disagree with that at all. Again it just depends on how long. At some stage India will be the global superpower, China the number two and the US number three, the scale of the economies will more or less dictyate this. IMHO the situation of the US vis-a-vis China and India is remarkably similar to the that of the UK vis a vis the US in 1918. Even down to the dollar and Bretton Woods II and the pound sterling and the gold standard. "Also, China is dangerously overconcentrated on manufacturing, which is increasingly commoditized and is turning into a low-return sector. They're in the position of a man running downhill; they have to keep going fast, or they fall over." All of this is (nearly) true, but you're taking an incredibly short term view. As you say they have to run very fast not to fall over, so they will - up through the value chain, and probably in historic terms very quickly indeed - which is why the rest of the world better watch out, at times the impact will be traumatising. "The Japanese ran into the limits of their model, but weren't able to reform it because of the way it's locked in with so many vested interests." They ran into the limits of their model in part for demographic reasons, this has always been the unrecognised sub-agenda for the Japanese problem. Now they have carried out considerable reform, but they are still not out of the woods, and they won't be, IMHO, since there will be no sustainable revival in domestic consumer demand. "there's certainly a demographic problem there, particularly in the long run"
Nope. I think the issue is with us now, and has been for some years, and in Germany, and in Italy. "well, that's scarcely a scientific measurement, is it now?" No it isn't, but then I don't think I ever suggested that it was. I think what I am suggesting is that we are in an area where the 'scientific' interpretations (for methodological measurement issue reasons, and this is *known problem*) are problematic. "And there's a reason why "anecdotal evidence" is a polite synonym for "utterly worthless."" Nope, I don't agree at all. Anecdotal evidence is often very important, depending on the way you interpret it and the weighting you give it. But it's a free planet, and you can believe what you want to believe, I was just saying that I was having a hard time comparing Paris with what I saw of New Orleans after the levees burst, and this was the kind of comparison you seemed to be making. Of course, as I say, you are free to believe what you want to believe, my purpose was only, from the other side of the pond here, to try and orient you a little. If you choose to be satisfied by reading off the numbers on a computer printout, then fine, but then maye that was the issue you were having with growth in the USSR. This is a highly subjective area. As far as I can see, if the people in Louisiana feel themseleves to be as rich as the people in France, and the people in France feel themselves to be richer than the people in Louisiana, then everything is just fine, since everyone has what they want, and end of story.